Ants Life Studio – Virtual Ant Farm | OhGizmo! If you’ve ever been fascinated enough with ants to want to stare at them all day, you may have considered picking up an art farm. But what if you happen to also have a soul? And feel bad about trapping those ants in your see-through prison? Enter the Ants Life Studio from Bandai, which is kind of like the next generation of their Tamagotchi cash cow. Instead of real ants, the Ants Life Studio presents a small colony of virtual ants who go about their daily lives of digging virtual tunnels, collecting virtual food and fending off attacks from virtual enemies. 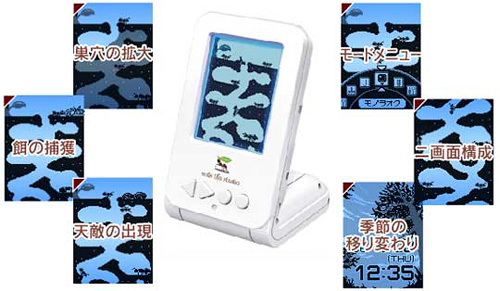 The monochrome LCD display features an electroluminescent backlight allowing you to continue your obsession with the ant’s lives well into the night, and it also includes a clock and calendar function for keeping track of what you actually should have been doing all day long. It’s currently only available in Japan, but you can get it from Japan Trend Shop for $99.